When it comes to volleyball shoes, there is one brand that has become one of the go-to options for numerous female athletes around the globe: Nfinity. The Nfinity volleyball shoes have been able to receive positive reviews on different online platforms. The BioniQ Boom 3.0 Volleyball Shoe is the latest footwear from Nfinity. Due to its innovative features, comfort, effectiveness, and affordability, it has become one of the favorite volleyball pieces of footwear now, and it doesn’t seem like this is going to change anytime soon. Nfinity designs its footwear for the female athlete who is driven and wants and believes she deserves a well-structured shoe. It is the only brand that is focused in creating high-performance athletic footwear that is lightweight, for females. This brand strives every day to design footwear for those athletes who struggle to obtain the recognition they truly deserve in their field. They want to address both wants and needs, and they are doing a good job. By addressing these two elements, Nfinity volleyball shoes can enhance their performance, with the goal of helping them decrease the risk of injury. The BioniQ Boom 3.0 Volleyball Shoe is structured of both fabric and leather. It has BioniQ technology in order to aid in supporting and guiding the foot in an ergonomic performance, enhancing positions during landing, jumping, and pivots. On top of this technology, this volleyball shoe also comes accompanied with QChannel technology which helps center the weight and foot when one is playing. The NfiniGuard offers reinforced toe guard, protect toes during diving and serving and provides shoe durability. Its forefoot cross-flex is able to groove on the sole to provide the maximum flexibility when you opt to change directions and speeds. Its NfiniLock technology can keep the arch locked in the adequate position and the foot really secure during backcourt shuffling and blocking movements. Its NfiniGrip gum rubber has a herringbone pattern on the sole to provide you with the optimal traction. The active ankle heel lining that accompanies this footwear protect it from tear and wear. As you can tell, the experts of Nfinity definitely wanted to knock it out of the park with this latest design, and they definitely were able to do so. When it comes to the overall structure, it is first class, which is definitely a very important factor that you should be aware of. It can last you for many years to come as it is structured of reinforced materials in the toe, sole, and heel. It was built to endure. It is clearer than water that the BioniQ Boom 3.0 Volleyball Shoe by Nfinity comes accompanied by more than a handful of pros, but there is one that stands out in great measure: price. The cost of volleyball shoes has been known to be on the expensive, but this is not the case with Nfinity volley ball shoes, especially with this one. Due to its affordability, it has made a lot of female athletes ask how this brand can provide such high-quality footwear at such a low price. Another pro that stands out is that unlike other volleyball shoes that are out there on the market, this one is designed for females of all sizes. As long your feet fit in them, you can make them yours! The BioniQ Boom 3.0 Volleyball Shoe by Nfinity also comes accompanied by a feature that might be a downfall for a lot of female athletes: color option. It only comes in the color black, which has made a few athletes upset, as they want to stand out in a game by wearing bright colors. 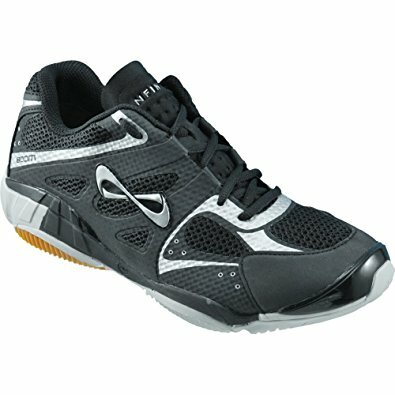 Other than this, this volleyball shoe is simply fabulous. One of the first things that you will notice when you receive this pair is the attention to detail as well as its thoughtful design. Everything that Nfinity creates is for the unique customer, from the way she moves to the way that she is shaped. The expert staff of Nfinity spends a meaningful amount of time developing high-performance materials and fabrics that out-perform the competition, all without ever sacrificing fashion. They are passionate about making a meaningful difference in the lives of every female athlete around the globe. Nfinity is structured with a team of marketers that like approaching every aspect of their business through a lens of seven core values, attributes that they believe results in good-quality products and thus a better company overall. Their values are aspirational, impeccable with their word, gracious, united, brand before all, the experience, and rocky. Constantly trying to enhance the brand with the overall experience that it provides, the employees of this brand represent it always, whether it is through social media, a coworker, or a customer. A Must-Have Pair of Volleyball Shoes! Nfinity volleyball shoes are designed for the female who trains hard, is a self-starter, dedicated, passionate, relentless, and fearless. BioniQ Boom 3.0 Volleyball Shoe is giving other shoes a run for their money. It keeps increasing in popularity, not only in the United States, but also in other countries around the globe. It is a must-have for every volleyball player out there.